It’s that time of year again! I love the BQF hosted each spring and fall by Amy at Amy’s Creative Side. If you are visiting my blog for the first time, Welcome! I hope you will take a few minutes to look around. I love traditional quilts, modern quilts, art quilts, pretty much anything and everything quilt related. If you are a regular big reader, you have already seen this quilt but I am sharing it again as my entry into BQF. So without further ado, here is Fiesta! I made this quilt for my daughter after she discovered a similar quilt on Instagram made by Jeliquilts. She has a free pattern available on Craftsy. I loosely followed her idea. I didn’t have the same fabric selection and my blocks are smaller. I started with roughly the same colors in the upper right hand side and just started playing from there. My finished quilt measures 36 inches by 42 inches so it just fit into the Mini Quilts category for BQF. I had a blast quilting this! I used Glide thread from Fil-Tec in Khaki. Here are some closeups of the quilting. Check out the other quilts in the BQF Small Quilts Category here. If you would like to vote for this quilt for Viewer’s Choice, you can do so here. Thanks for stopping by! And enjoy the Spring Blogger’s Quilt Festival! 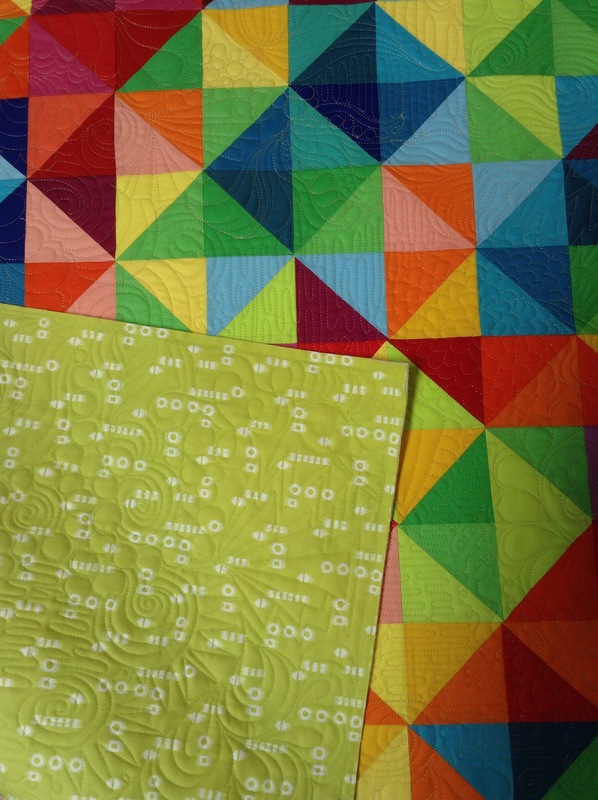 This entry was posted in BQF, Free Motion Quilting, Modern Quilts. Bookmark the permalink. This is stunning!!! You just got my vote! I absolutely love the pixelated effect and your color balance is fabulous! 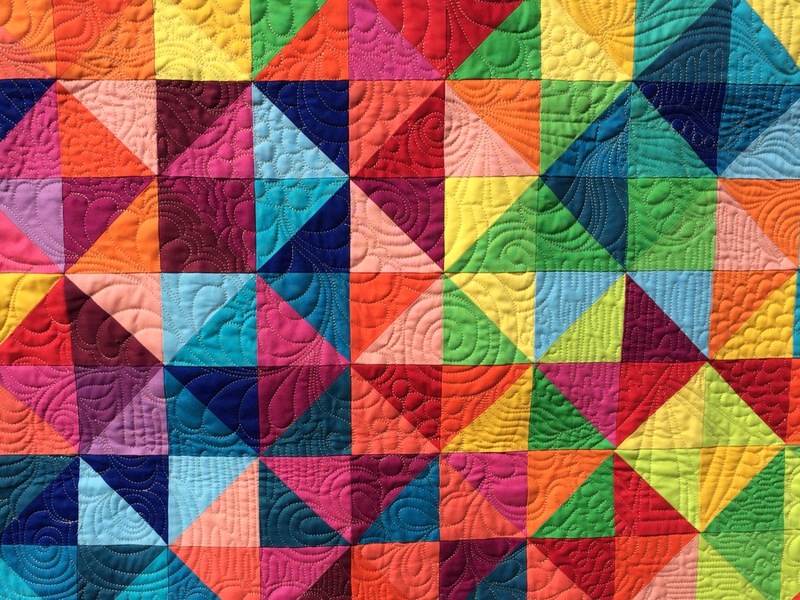 Always enjoy HST quilts and this is a beautifully vibrant example! I don’t know how you decided where to place each color, but you did a beautiful job! It would take me years to settle on where to put everything, but I am so tempted to try! Its wonderful! This is gorgeous! I think I saw the one that was your inspiration too, and I never get tired of the bright, happy colors. Gorgeous quilting! Perfect for this design! 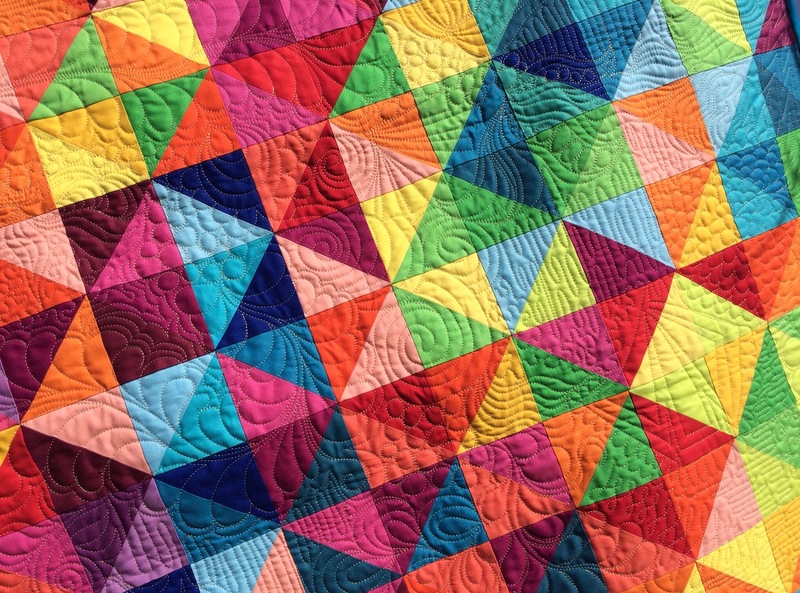 such a fun design – your quilting is so awesome ! Amazing quilt! 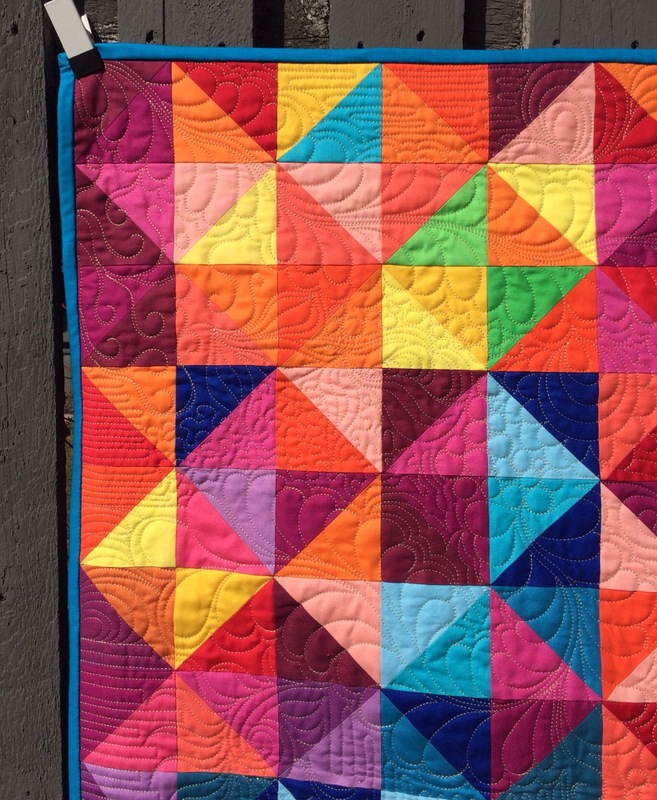 It’s just so happy – and that quilting is gorgeous! Lovely colourful quilt and super quilting too. 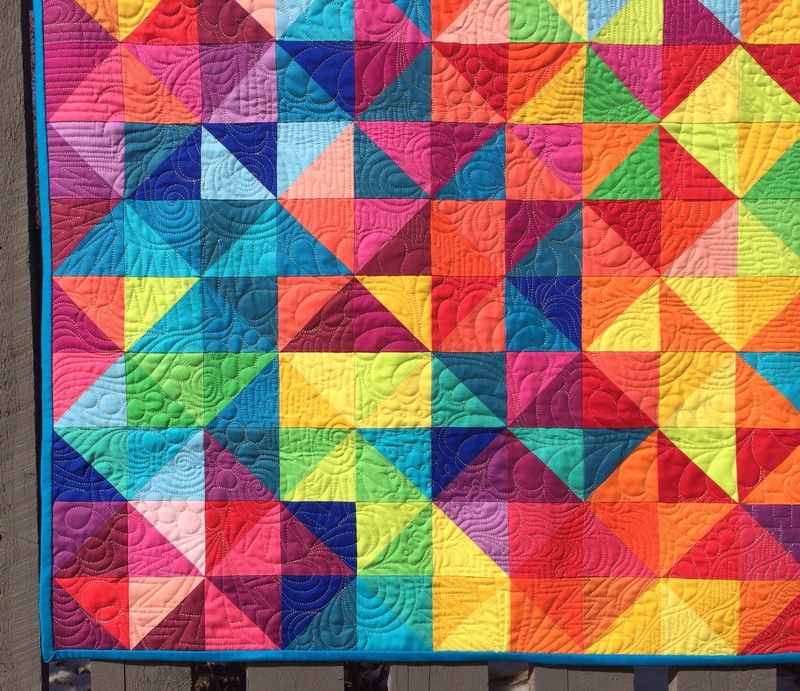 a gorgeous bright and colourful quilt, beautifully quilted! Fiesta is Fantastic! Both the quilt and the quilting you did are completely awesome Katy! I might enter mini, not because I think I stand a chance, but just to be part of the fun. Oh, this is so beautiful! A great quilt! 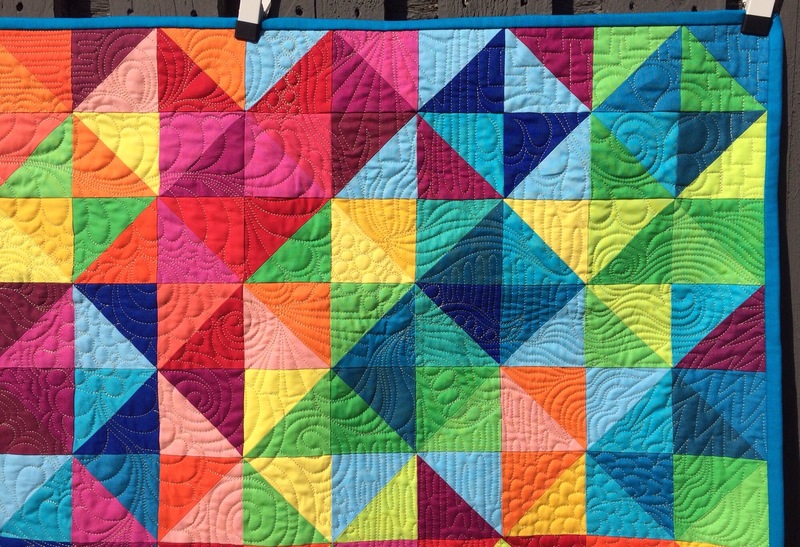 Love the colours of this quilt and also really love the quilting. You have done a wonderful job. What a wonderful quilt. Both the selection and placement of fabric as well as the quilting make it outstanding. Beautiful. That color flow is awesome. How did you go about deciding exactly which colors to put where? Love the colors! It looks great! Fiesta is the perfect name for this quilt. Very pretty! I love it too! Serendipity – I was creating a ‘half square triangle board’ on Pinterest, switched to my e-mails and first up was your post with lots of lovely photos of Fiesta! It’s now on my board! 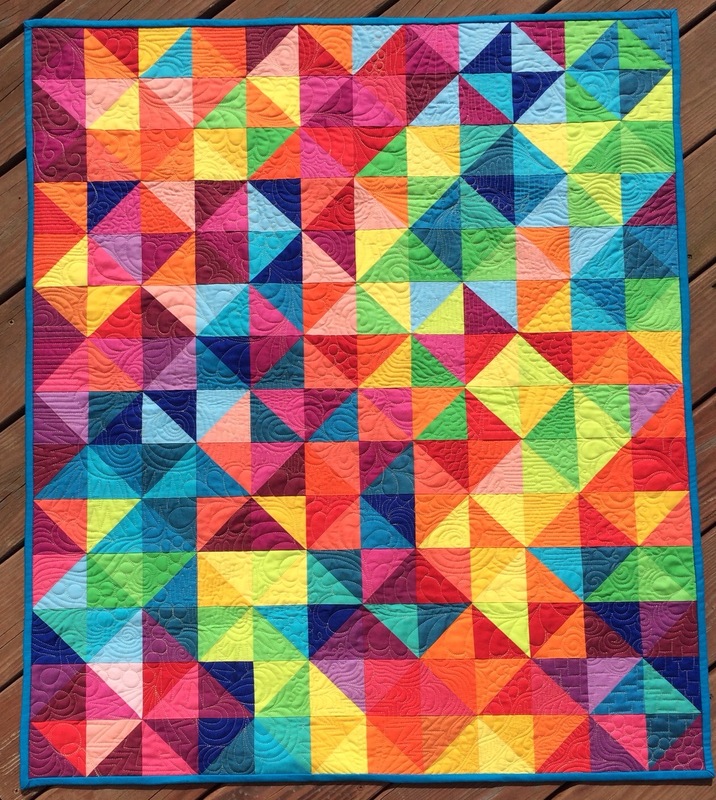 Love the colors, and the quilting is inspiring me to do more with my own quilting skills! I love it! 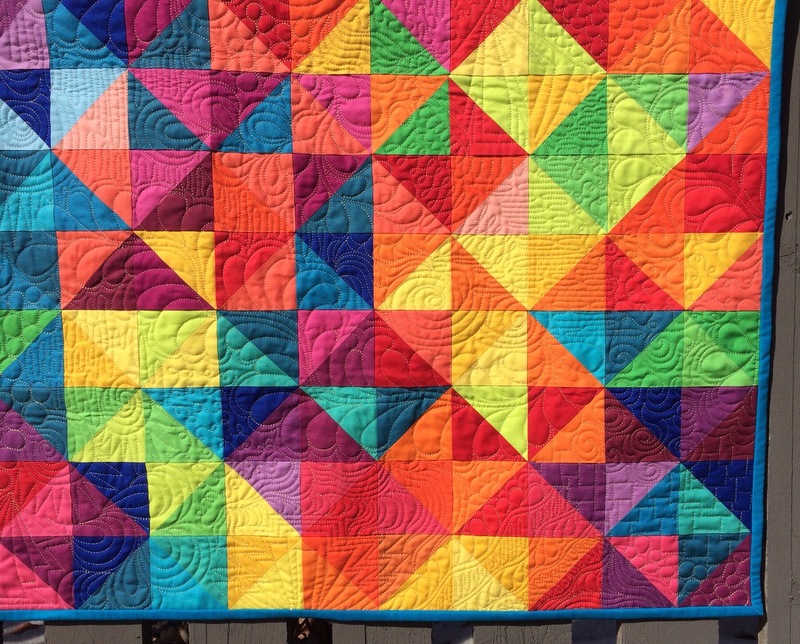 the colours are fab and the quilting amazing! You had a blast quilting it, I had a blast admiring it! Even the second time around, I still love it!! This is just such a happy quilt! Seeing it always makes me smile. Good luck!